Quite windy first thing so No.3 and a reef. Avoided the melee at the start and made the most of the first hours worth of favourable tide up the Solent. Wind gradually died so shook out the reef and changed up to the No. 1 without too much fuss. Now with adverse tide headed over the Bramble Bank dodging the other fleets racing across us and headed for East Bramble although we thought it was South Ryde Middle. Once round spinnaker up and headed for the finish in error, quick course check and headed up to the correct buoy but now at a rather tighter angle and managed to wrap the spinnaker pole round the fore stay. 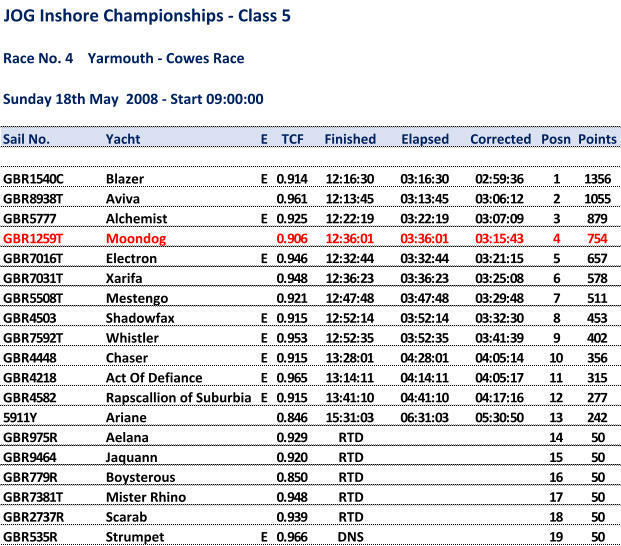 However, managed the finish without further mishap or being overtaken and came in 4th on corrected.